From beautiful shimmering dresses to bouquets of flowers, the Barbie Wedding Gift Set is full of wedding fun! 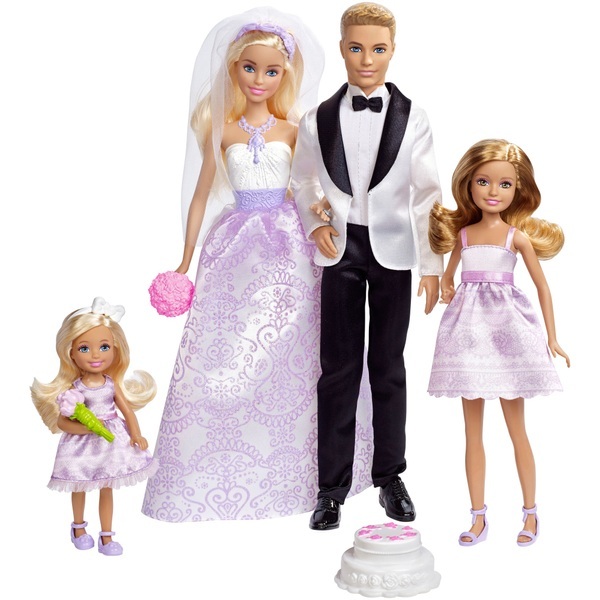 The Barbie Wedding Gift Set features a bride, a groom and two bridesmaids. Serve up the frosted toy wedding cake for the guests and help Barbie throw her bouquet out to her bridesmaids and friends at the end of the party! Each Bridesmaid comes with a cute hand held bouquet and stylish lavender dresses that match Barbie’s wedding dress. A removable headband with a veil, a sculpted necklace and a pair of matching shoes complete Barbie’s wedding day look while Ken is dressed in a handsome black and white tuxedo.